Do you find yourself in one of these positions? Are you frustrated by the corporate rat race? Are you retired and still in need of additional income? Have you recently graduated from college and you’re having trouble finding a job? Were you discharged from the military and now you’re looking for a new career? There is a one-day event coming up that may help you in your situation. The seminar is called Franchising 101, and it’s sponsored by the New England Franchise Association (NEFA). You can learn everything you need to know about buying, financing and managing a franchise. Franchising 101 takes place March 6th 10am-4pm at the Hilton Woburn, 2 Forbes Road, Woburn, Massachusetts, 01801. Seats are limited so pre-registration is required. To register, click here. Franchising 101 costs $49 for NEFA members and $99 for non-members. To reserve a seat for this event, please visit the New England Franchise Association’s website. Hope to see you there. Kim Woods, CFE Senior Client Consultant at Franchise Solutions, serves as the Vice President on the New England Franchise Association board, and will be on location on March 6th to answer any questions you may have regarding finding the right franchise for you. 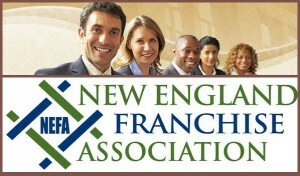 New England Franchise Association (NEFA) is the trade organization for franchisors and franchisees in the region. The mission of NEFA is to bring franchise executives, franchisees and suppliers together to share ideas for success. Franchising more than ever before, has an unprecedented opportunity to make a major positive impact on the future New England economy. In a 2001-05 study conducted by PriceWaterhouseCoopers on behalf of the International Franchise Association (IFA) found that in New England over 875,000 jobs are a result of franchising, the total output is over 100 billion dollars a year, and there are over 35,000 franchise establishments in the six New England states.